Over the last few days, Jennifer has been off work, so I’ve been able to spend more time in the shack working on Project X. I only recently made my first QSO with the prototype rig (I think propagation was unfavorable for me when I was trying late in the evenings), so I’ve been leaving the radio hooked up to my bench AF amp and monitoring 7030 kHz during the day. Late this afternoon, I heard a very strong station calling CQ just a bit up from 7030. I bumped the VFO up a bit and found that it was KE7GKM calling at a nice, comfortable speed for me (my CW is rusty after quite a few months off the air). While I called him back, the thought occurred to me that the call sounded familiar, but I couldn’t remember how. After getting the QSO basics out of the way, I remembered why. 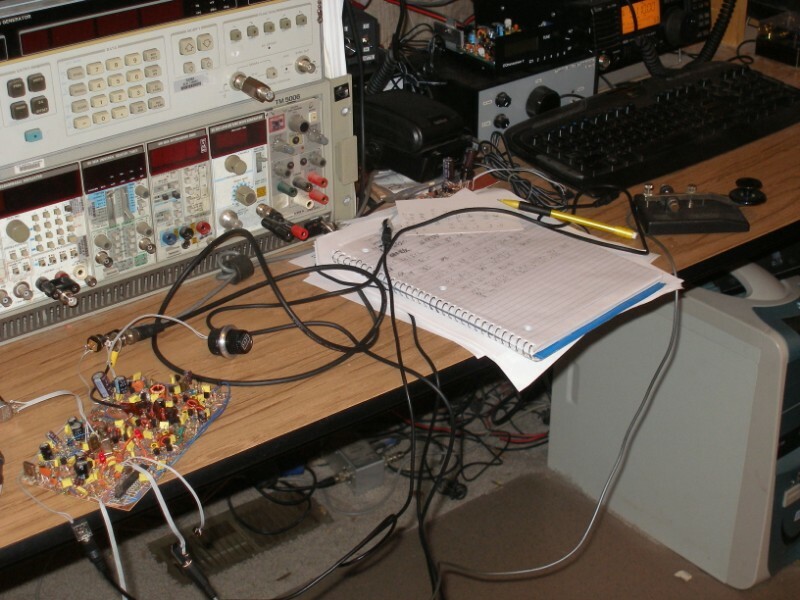 Bob said that he was using a VRX-1 and homebrew QRP transmitter combo! Then it hit me that Bob had just e-mailed me about a week ago to ask me a few questions regarding the VRX-1. I don’t get on the air as much as I should (seems like I’m melting solder way more than pounding brass), but when I get a chance, it means so much to me to have a contact with someone who has built one of my radio designs. It’s even more special when I get that make that QSO with a homebrewed radio on my own end as well. If I remember correctly, this is only the second time that I’ve done such a thing. Bob told me that he is trying to get to 100 QSOs with his VRX-1/HB TX combo, and that I was QSO #80 (if I remember correctly, my notes aren’t great). I wish Bob all the best of luck in his endeavor. It certainly looks like he doesn’t have much more to do in order to meet his goal. It’s hard to beat an experience like this in capturing the essence of amateur radio for me. It is my hope that more amateurs will homebrew their own gear so that they can get that same thrill. Imagine how much fun it will be when you have the first Project X to Project X QSO! How’s the PCB coming along? I’m curious to know what the pricing will be – do you have any ballpark ideas, or is that a secret known only in the deepest inner circles of the boardroom at NT7S Inc? Dave, my beta PCB boards should be going out for order shortly. With any luck, beta testing can begin within a month or so. I’m hesitant to put any number on pricing out there in the public right now, but I think it’s safe to say that it will be on par with the other single-band QRP kits out there on the market. There is nothing particularly exotic, component-wise. Thanks so much Chad! I’ve sent the documents to you, and hopefully I’ll have a chance to get them put on my website some time in the near future.